Most people only know about Al Gore's documentary about global warming, The Inconvenient Truth. Well, there is another documentary about the environment and about global warming. And believe it or not, it's a film produced and narrated by none other than Titanic star, Leonardo di Caprio. 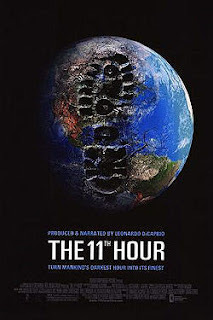 So can this documentary fight toe-to-toe with Al Gore's award-winning creation or should it be forever overshadowed by The Inconvenient Truth? For us, the documentary itself was so-so overall. It was more like watching a two-hour Discovery Channel special feature than actually watching an actual documentary film. It was an amalgam of quotes by environmentalists, scientists, politicians and more. Even Leonardo's part was notably more quote-y in its delivery than narrative. We think that it actually lacked actual facts and figures to give more oomph! or impact towards its audience. It focused more on opinionated and we conclude, less credible means. But all is not lost for this documentary. Even though with all of the negative things we said before, we actually believe it had a better idea to solve the eco-crisis that have been plaguing us in recent times. Instead of actually trying to present the world in a state of crisis and being deathly-ill, it turns the table around. It actually tries to make us see that the world will and has the capacity to move on and we, humans, are the ones who are in crisis. We are the ones who will become extinct in the end, not the Earth. For us, this showing of the fragility of the human race can actually make people move and lessen the fundamentally-ill mentality that we are above nature. We also liked that it suggested and even showed possible and feasible solutions to our current crisis. Too bad that this film was overshadowed and downplayed by Al Gore's masterpiece. And that is the inconvenient truth for us and probably for Mr. di Caprio. - it can be a life-altering film. - it is somewhat informative and straight-to-the point with its viewpoints. - less scientific, more point of views of different people; meaning it can sound less credible. - more like a documentary for television than for the big screen.